Preserving the natural teeth to achieve functional and esthetic results without compromising the biological width is primary goal of dental surgeon. Some clinical situations including cervical caries and short clinical crown or fracture at cervical level may dictate the placement of restoration margins below the gingival tissue crest, thus invading biological width. When a restoration is placed in violation of this principle, a chronic inflammation occurs. In such cases, it is necessary to increase the size of clinical crown either using periodontal surgical procedure or orthodontically extruding the tooth. Although surgery is more common option for such cases, it poses the risk of gingival recession. If the biological width violation is on the interproximal or across the facial surface and the gingival tissue level is normal, then orthodontic extrusion is indicated. Although orthodontic extrusion for such cases was introduced in 1973, it is not used in common practice, maybe because of complexity of the procedure. Furthermore, literature is lacking in the long-term follow-up. 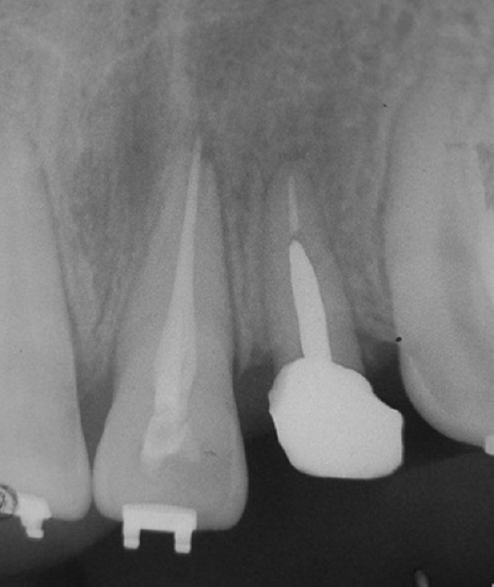 In this case report, procedure is presented in a simplified way and with 32 months of follow-up. A 19-year-old male patient reported 20 min after blow injury to the maxillary anterior region to the Department of Conservative Dentistry and Endodontics with a chief complaint of fractured tooth. Clinical and radiographic examination revealed fractured maxillary left lateral incisor below gingival margin [Figure 1]. At that time, even maxillary left central incisor did not respond to vitality test. 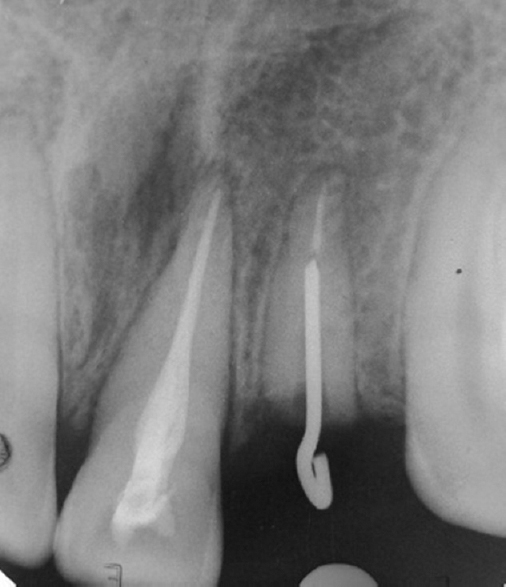 The patient desired the tooth replacement but not at the expense of extraction. 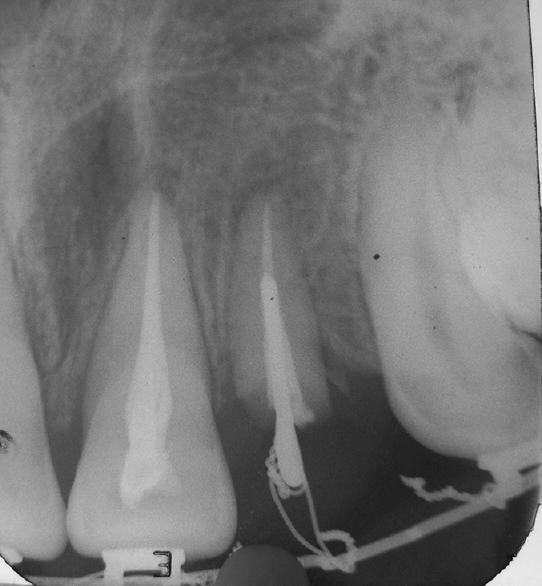 Remaining root length was calculated on radiograph and found to be 13 mm, with coronal level adjacent to the crestel bone. After consideration of crown-to-root ratio, it was decided to extrude 4 mm of root orthodontically to maintain crown-to-root ratio 1:1 and to preserve the biological width. Root canal treatment (RCT) of lateral incisor was started at the first appointment. On the next appointment, maxillary central incisor was severely tender. Hence, RCT of central incisor was also started. Ca (OH)2 (prime dental) dressing was given for 7 days. RCT was completed after 10 days, and postspace was prepared [Figure 2]. After the patient was free from all symptoms, the case was discussed with the Department of Orthodontics for orthodontic extrusion. It was decided to bond brackets on maxillary left canine and both central incisors to act as anchoring teeth. Prepared postspace was checked for insertion of 21G wire with an eyelet (Ormco, USA). Wire was cemented with zinc phosphate cement (Harvard cement) keeping the eyelet outside the root portion available for the insertion of elastic band [Figure 3] and [Figure 4]. Then, 0.0175” multistranded wire (Ormco, USA) was adapted to the brackets on the anchoring teeth passing over left lateral incisor. An elastic band was engaged between eyelet and orthowire. First supracrestal fibrotomy was done on the day of activation of elastic band [Figure 5]. After 4 weeks.,0175” wire was replaced with. 0195” twist flex (Ormco, USA), and fibrotomy was done. Fourteen days later, wire was again replaced with rectangular wire. Desired tooth movement was achieved within 8 weeks which was confirmed radiographically [Figure 6]. On completion of tooth extrusion, fibrotomy was done to reduce the intrusive forces. Thereafter, retention wire was placed for another 1 month. 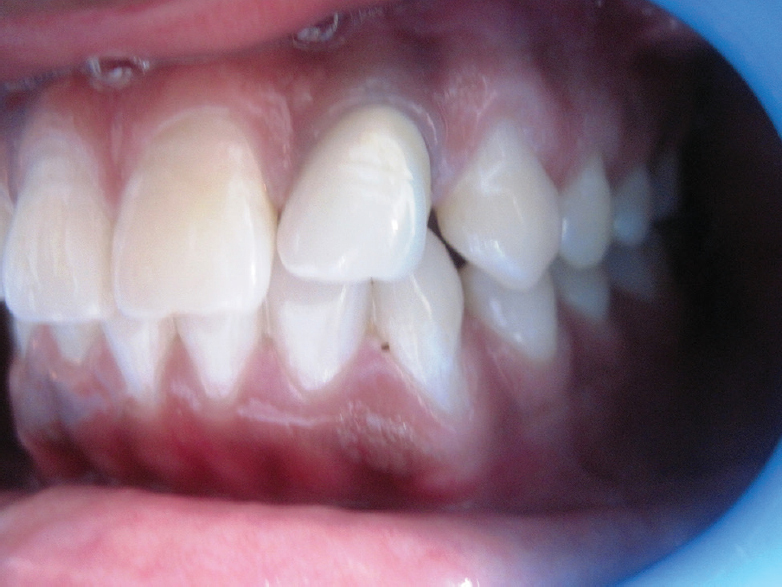 After retentive phase, the orthodontic brackets from the teeth and wire with eyelet from lateral incisor were removed. Rubber base impression (3M ESPE) was taken following which cast post and core was fabricated with proper ferrule and cemented in the prepared space [Figure 7]. After 2 days, refinishing of core was done to receive porcelain fused to metal crown. Another impression was made, and porcelain fused to metal crown was fabricated and delivered to the patient [Figure 8]. The patient was recalled every 6 months for follow-up. On the fifth recall after 2½ years, it was observed that the tooth is serving esthetically and functionally well. 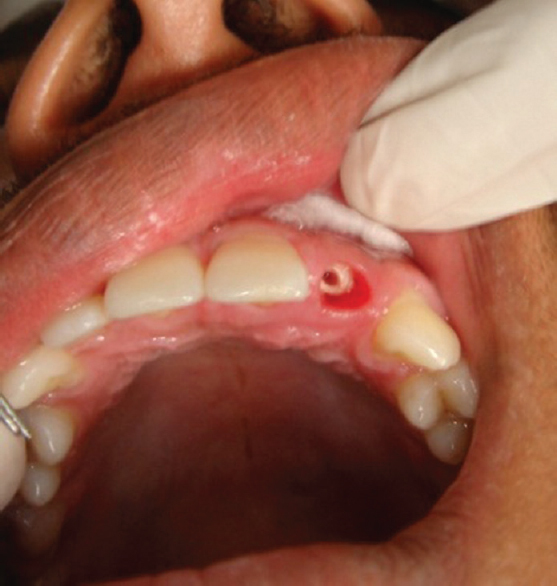 Clinical pocket depth was normal and gingival tissue was healthy. Radiographic examination revealed healthy attachment apparatus [Figure 9]. Commonly, there are cases in which the traumatic injury by direct or indirect impact results in crown of the tooth becoming completely fractured off from the root at the gingival level or slightly below and may extend into the area just below the alveolar crest. These types of injuries are called crown: root fractures. 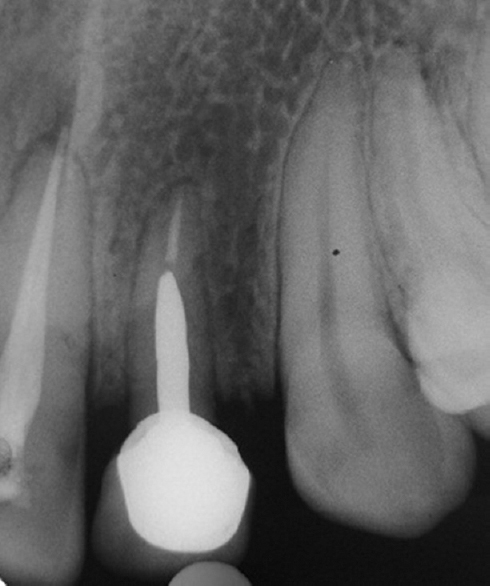 In such cases, coronal fragments must be removed if it is still attached with gingival fibers. Treatment options for such cases include orthodontic extrusion with crown placement, surgical crown lengthening with subsequent restoration, and thus, preservation of the natural tooth or extraction followed by bridge or implant placement. As extraction is followed by loss of bone as well as soft tissue, it should be the last resort. In the present case, fracture line from interproximal, facial, and lingual aspect was invading the biological width; thereby, direct placement of restoration was not possible without jeopardizing the health of gingival tissue. 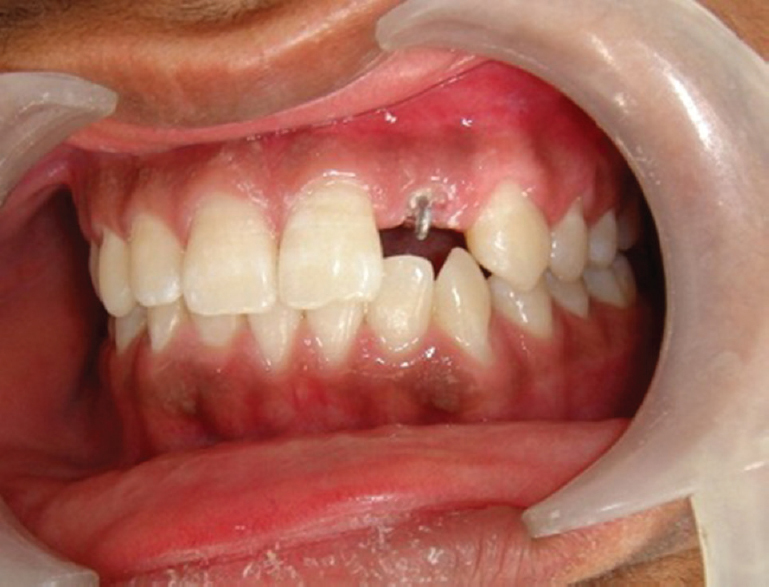 Remaining treatment options were either surgical crown lengthening or orthodontic extrusion. Although surgical crown lengthening is fast procedure, it involves apical flap positioning with ostectomy needed to correct the ideal biological width for the patient, with an additional, 0.5 mm of the bone removed as a safety zone. At least 3–4 mm of root structure must be exposed below the most apical extent of the proposed restoration. In addition, the alveolar crest of the adjacent teeth must be blended in with the involved tooth; otherwise, an uneven, unesthetic gingival profile will result. Hence, it not only sacrifices the bony support of the neighboring teeth but also may lead to unfavorable root exposure and reverses bone and soft-tissue architecture. At the same time, it results in unfavorable crown-to-root ratio. 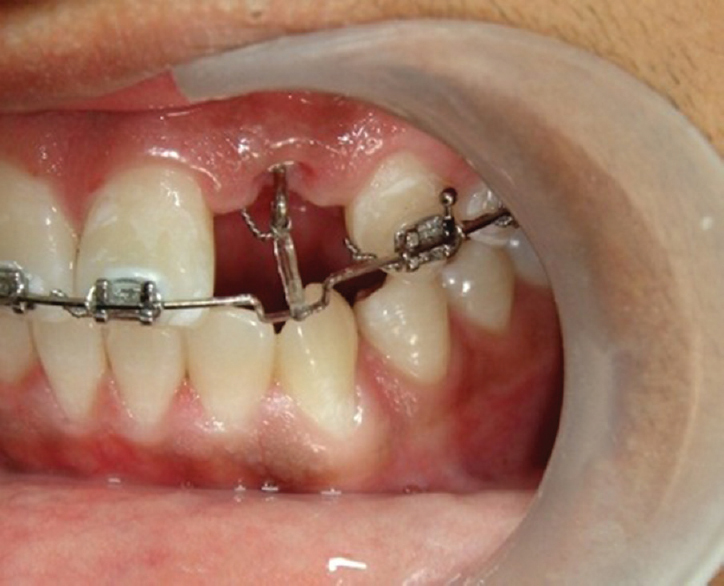 Orthodontic extrusion is more physiologic and conservative than surgical crown lengthening. Indications for orthodontic extrusion include fractured tooth margin below the crestal bone,, teeth with defects in the cervical third of the root including caries, perforation from root resorption, iatrogenic perforations, treatment of infrabony defects and where it is necessary to slowly extract a tooth, when radiation therapy presents a risk of postextraction radionecrosis. Orthodontic extrusion usually requires 4–8 weeks. In general, about 1 mm of movement is achieved 1–2 weeks, using orthodontic forces of 15–30 g. Orthodontic extrusion can be achieved either by slow or rapid tooth movement. When the orthodontic movement is slow, the alveolar bone and gingival attachment tend to move along with the root. This will often require some soft- and hard-tissue recontouring to achieve an acceptable crown margin an acceptable biological width, and a favorable esthetic appearance of the gingival margin compared with that of adjacent teeth. Rapid orthodontic extrusion with fiber resection has been suggested as an alternative to incorporating surgical procedure with extrusion. Orthodontic forces will pull root out of bone whereas fibrotomy prevents the tooth and alveolar bone from erupting as a unit, exposing sound tooth structure without changing the position of the alveolar crest or free gingival margin. In addition to achieve the desired results, the crown-to-root ration of the adjacent teeth remains intact and decreases for the involved tooth, thus improving the long-term periodontal prognosis. In determining the suitability of a root for extrusion, the final crown-to-root ratio must be estimated. In the present case, crown is fractured at the level of crestal bone with remaining root length 13 mm. The postoperative root length was estimated at least 4 mm less than the overall root length because of allowance of 1 mm of clinical crown and 3 mm of biological width and gingival sulcus providing the optimum crown-to-root ratio of 1:1. Here, we used rapid orthodontic extrusion with fiber resection. Thus, the movement of bone and gingival tissue along with tooth is prevented eliminating the need of postoperative crown lengthening. There is some evidence in the literature that supracrestal fibrotomy before, during, and after the forced eruption may decrease intrusive tendency and thus decreases the time necessary for postmovement stabilization. This also reduced the tension on periodontal ligament, thus making the rapid movement and potential for adverse sequalae such as resorption and relapse also reduced. Although various options exist for treating the fractured tooth, orthodontic extrusion combined with sulcular fibrotomy is most predictable and conservative to periodontal ligament. It prevents the movement of bone and gingival tissue along with the tooth, thereby eliminating the need for corrective surgery. Preservation of a tooth is primary goal of dentistry, but it should not be done at the expense of violating biological width principle. Thus, treatment plan requires careful evaluation and diagnosis. This case report shows that orthodontic extrusion is a simple, conservative, and reliable method to successfully treat a tooth with subgingival fracture resulting in a good long-term prognosis. Michael N. Carranza: Clinical periodontology. 9th ed. Saunders Publications, New Delhi; 2003. p. 949-51. Berman LH. A Clinical Guide to Dental Traumatology. 1st ed. Mosby, St. Louis; 2007. p. 51-71. Dale A. Esthetic Dentistry: A Clinical Approach to Techniques and Materials. 2nd ed. Mosby, St. Louis; 2001. p. 353-8. Smidt A, Lachish-Tandlich M, Venezia E. Orthodontic extrusion of an extensively broken down anterior tooth: A clinical report. Quintessence Int 2005;36:89-95. Kim SH, Tramontina VA, Ramos CM, Prado AM, Passanezi E, Greghi SL, et al. Experimental surgical and orthodontic extrusion of teeth in dogs. 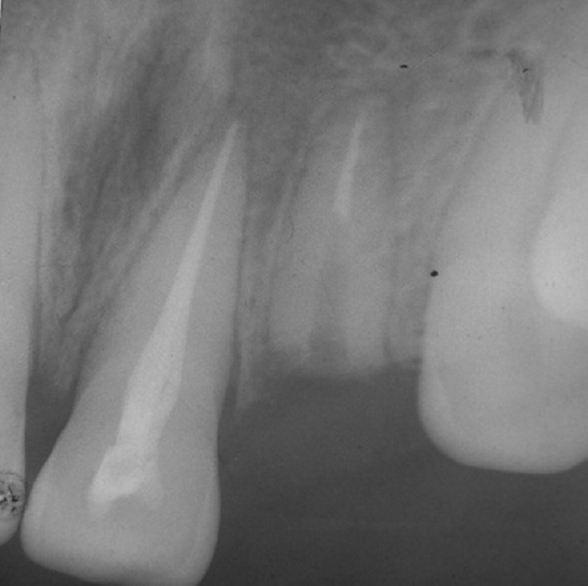 Int J Periodontics Restorative Dent 2009;29:435-43. Heithersay GS. Combined endodontic-orthodontic treatment of transverse root fractures in the region of the alveolar crest. Oral Surg Oral Med Oral Pathol 1973;36:404-15. Simon JH. Root extrusion. Rationale and techniques. Dent Clin North Am 1984;28:909-21. Profitt WR, Fieldsjr HW. Contemporary Orthodontics. 3rd ed. St Louis: Mosby; 2002. p. 627-8. Bach N, Baylard JF, Voyer R. Orthodontic extrusion: Periodontal considerations and applications. J Can Dent Assoc 2004;70:775-80.